The Waverley Scotland Tartan Cloth Commonplace Notebook - Hamilton Red uses the world famous Hamilton Red Tartan. 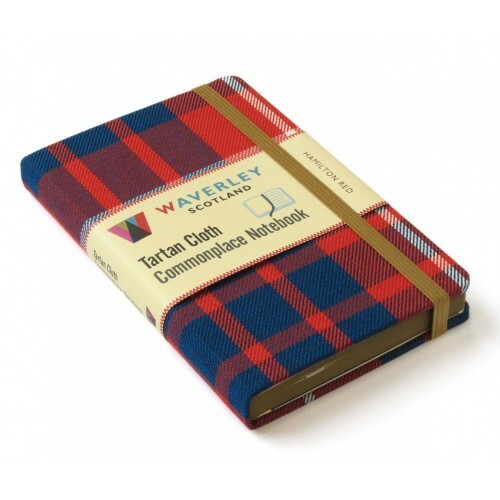 The Waverley Scotland Tartan Cloth Commonplace Notebooks each with 176 pages (left side blank, right side ruled), acid-free, threadsewn, 80 gsm cream shade pages, are bound in genuine Scottish tartan cloth over board, with round cornered cover and bookblock corners, stained edges and a matching elastic enclosure. Available from mid-April 2016. Each volume has a ribbon-marker and an expandable inner note holder made of cardboard and cloth, and removable booklet with background notes, with a Clan Map of Scotland, and with an individual bookmark, giving detail on the specific tartan used for the binding. The tartan cloth is supplied by and produced with the authority of Kinloch Anderson Scotland, holders of Royal Warrants of Appointment as Tailors and Kiltmakers to HM The Queen, HRH The Duke of Edinburgh and HRH The Prince of Wales.